Even before the transfer window opens the management of Sengkang Punggol FC has already began handing out pink slips. No surprises given how atrociously the team underperformed after the League Cup exploits. With only one win and one draw to show from ten matches, even the least ambitious team would know that changes is inevitable. But with so many obvious candidates primed for the chop, the last person I could possibly imagine leaving is MURPHY WIREDU. An omni-presence regardless of his position on the pitch, the drive and commitment he displayed has always been second to none. Be it a marauding winger tearing down the opposition flanks, a goalscoring forward with solid returns or a defensive rock he has always performed well, or at the very least to the best of his ability. The wondrous Zidane-esque volley against Young Lions is already tattooed in my head as one of the best goals. Ever. That goal deserves a bigger and better stage. And with that well wishes the best performing Dolphin for the past one and a half season, and my Player of the Year last year, is gone. All the best in your future endeavors, Murphy. You’ve been great. Fret not, better things await. Now let’s see if his replacement measures up. For the past four days (at least), whenever I googled the Sengkang Punggol website for my daily dose of news, I get redirected to this page. Either this is an accomplished piece of viral marketing campaign to unveil the club’s new sponsor, or someone’s doing a screwup of a job maintaining the website. After a week long of media build up for the crucial Asian Cup qualifying game to be held at Kallang Stadium against our most bitter ASEAN rivals (well Malaysia not in the same league as us for long long time now), there was an air of anticipation for the Lions to do the job at home before taking the driving seat to Rajamangala Stadium in Bangkok on Wednesday. It turned out to be faux pas as the team Raddy selected played second fiddle to a Thai side under Manchester United legend Bryan Robson for the first time. The final score did reflected the affairs on the pitch as the Thai deserved a win and perhaps by this much of our margin. As 20000 fans including yours truly showed up for the game, sadly our team did not showed out. From the word go, our team lack any shape and imaginative going up. It turned out to be the pattern of our play for the remainder of the game as the players could not string 2 passes together before giving the ball away. The crossing from the wings especially Ridhuan and Noh Rahman was slipshod while Duric and Noh Alam up front could not trap the ball with a yellow jersey wearing them like a second skin. John Wilksinson had to drop very deep to dictate play but he and Mustafic were closed down very fast by the Thai midfielders throughout the first period. In defense only Daniel Bennett and goalkeeper Hassan Sunny worthed a mention as Saiful Esah under the media glare since singlehandedly destroyed Indonesia in the meaningless friendly a week before with his setpieces looked shaken up by the occasion but he was still better than the former Geylang United pair Noh Rahman and Baihakki Khaizan. Soon to be departing Sengkang Punggol, Noh Rahman gave his future employers a sign of how he had grown stagnant. He is good enough for the S League but on international scene, he was all downhill since valiant display against Lebanon many moons back. Then the weakest link of the game Baihakki Khaizan like Ridhuan Muhammad (and maybe the early departed Noh Alam Shah) had shown playing in the Indonesian Super League had done nothing to improve their reputation instead thwarting their game still. Bai’s poor judgement allowed the Thai to score their second; then he looked marooned in his old world when Sutee beat the offside trap to score the third, by then the stadium looked 1/3 lighter as many disgusted fairweather fans had went for supper and wondered why they bothered spending 6 bucks and 70 minutes of their precious time here. To add salt to our wound, the scorers for Thai were basically half Singaporean for the time they spent playing football here. 36 year old SAFFC midfield maestro Thersak Chaiman was a shock inclusion in Robson’s squad but he vindicated his inclusion with the second goal. But it was Sutee Suksomkit who spent like a decade here with Tiong Bahru, Home United and subsequently Tampines Rovers before leaving for A League side Melbourne Victory recently, was the man of the match with his goals, running and constant menace up front as the remaining Thai team weren’t exactly hitting the right gear. Many spectators were hurling scathing remarks on the Japanese referee but I felt he did a great job handling the game. He was quick to respond to some fouls which were uncalled for and defuse many situations. The only problem was that he turned down at least 3 clear cut handballs in the box from the Thai which looked more legitimate than the one awarded against us. Perhaps he should show Baihakki his second yellow for his clueless lunges the entire evening. As for the Changsuk, the nickname for the Thai team I was sorely irked by their playacting and time wasting antics on the pitch as they wound down a famous victory at the Ol’ Lady. They had littered the match with alot of typical cramps and what not, forcing the Lions to break down their play (which was not many to begin with). Taking 3 goals lead and coasting for the win, they argued incessantly when the referee awarded us a penalty on the blatant foul on Khairul Amri and led by their goalkeeper, they tried to distract Mustafic with delay and theater play. 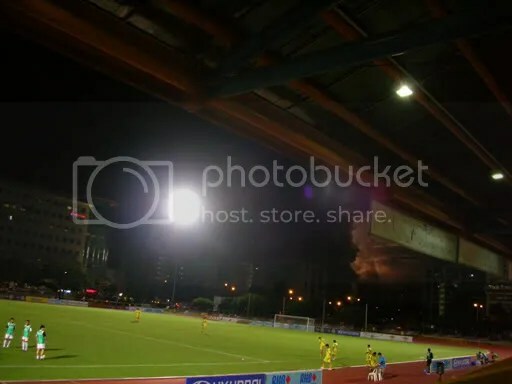 As the king of ASEAN football (the Vietnamese will object), they should really cut down such acts and show the real side of football in them. As for the Lions, another despondent display when the odds were stacked on them. It was true the Thai contingent which accounted to about a thousand or so were in good voice which engulfed the feeble cheering from our own fans but how was we to cheer when there was nothing to cheer about. It looked palpable that we would need another 4 years to try progressing into Asian Cup and let’s hope deadwood Duric would not be around by then. Maybe Bai and Ridhuan too. This has got to be a first in any professional sports in this world: a national player with over a hundred caps and a key striker his struggling club is relying on to score goals, turning out in a school match. I wonder if some avid followers of this blog would take notice that there was no pre-match analysis and match review for our clash against Super Reds last night. It was not I do not have the time to do it, but I am starting to feel like what’s the point. As predicted, Sengkang Punggol FC playing in front of a feeble crowd of below 1000, solely made up of complimentary ticket holders and suspicious blowing up of crowd attendance from the officials at home turf of the shoddy stadium that is known as Hougang Stadium, losing feebly to Super Reds FC despite having perhaps the actual first eleven from the senior squad. I am not a fairweather fan of the Dolphins despite my scathing criticisms to our team can rub off badly to some but deep inside I always hope they can really become a better side. Not a title contender but one that can compete with dignity intact and yet mustering points especially at home. It was also the first season I can say I followed closely since the interest was rekindled in early 2008. It is hard to support an ailing team as many can testified but how many times I had to tell myself “enough is enough”. 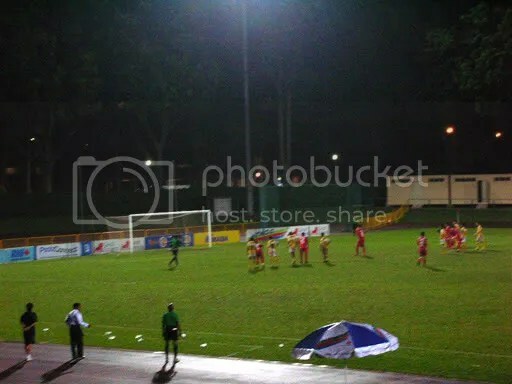 There was no point making effort to travel to Hougang on the expense of my own hard earn cash and precious time to catch slipshod, languid losses from the team I supported who cannot even put one over teams like Young Lions and Balestier Khalsa in front of the home crowd. 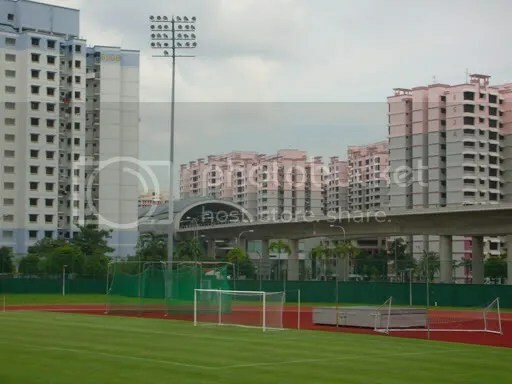 I have made up my mind to just stay off live matches till when i seen fit for now but I still wish Sengkang Punggol FC all the best in the remaining 6 league matches. I will still continue to update this blog on frequent basis and entertain any comments from my long-suffering compatriots who truly had yet to wane off in interest when mine had. Okay now to the big picture, the decadence of our local S League. You might been living under a rock if you had not notice the recent tirade by Noh Alam Shah in his press conference before his depature to join Arema Malang in the Indonesian Super League. A man with controversy was also the most earnest and forthright person who amplified the problems plaguing our local game, constantly being masqueraded by authorities who abstained from bad publicity even at the cost of losing appeal and popularity of the game. Hogging on to the “Top Ten League in Asia” title for like ever, FAS and S league was bracing for one day the entire deception would just explode in their face. Since day one, me and my partner had not have good impression with the authorities who sold their agenda to the club, coaches and players who frowned at the slightest bit of description which put them under a bad light. I have lost counts on how we had been scuppered to produce the most trustworthy reports of what we had seen in live matches, just because it might put some people’s career in jeopardy while the elder statesmen and their usual entourage who did their routine match attendance, digging into their free buffet and as we said basking in their “private party”, find our reports a tad too cringeworthy for their liking. There are thousand and one faults to find in the S League in the past 2-3 years and it did not seem like it was going to be address as people in the ivory towers are simply resting on their laurels. So what if fans do not turn up for live matches? Gate receipt is not a mean of revenue. As long as the army of punters are still making the beeline to check on the odds of how Tampines can beat SAF, it’s okay. So what if we can make it into the AFC Champions League in the future? It’s okay since AFC Cup is good enough even when we always come short in the quarterfinals of the competition. So what if the national team never make it into any major tournaments? It’s okay as long as we can beat Malaysia and hopefully make it into the semi finals of AFF Cup while our Young Lions do not get humiliated in the SEA Games. 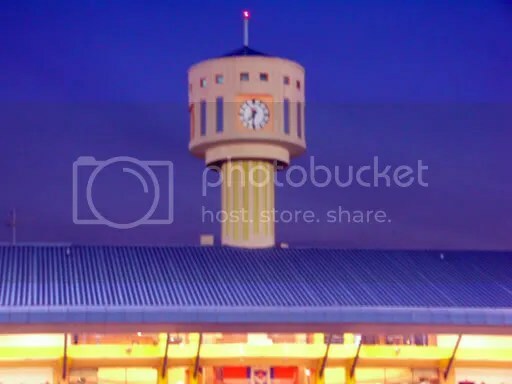 FAS already know our nation is filled with glory hunters, EPL slaves and post-M League fanatics, but there is still a group of us who actually care about the progress of local football. It did seem like they are isolating us when they failed to perk things up, instead bringing the local game into the demise. It’s time to wake up FAS.